If you would like to contact or book Panic Circus here are our contact details including Phone numbers and email addresses. Gereint Maddocks (Gee Panic) was found next to a tree in 1983 By Prof. and Madame Panic whilst on tour with zippos circus. They wasted no time at all! Jumping him straight into a strict and Vigorous training routine, teaching him how to walk on stilt (before he could even crawl). He went on to become the trainer of the legendary infamous Terry the tremendously terrifying fire breathing trout. With Gee Panic being born into the world of Travelling circus he is a natural performer and adept at teaching all aspects of circus skills within Panic circus. He continues the long running family tradition of four generations performing traditional Punch and Judy shows with a modern twist. Gee Panic runs Panic Circus performing circus shows, Punch and Judy shows, workshops and is also the web master to the Panic Circus website. prof Panic was the founder of Panic Circus. A trained and respected teacher, Panic has worked in the "system" as both a primary teacher and Community and Arts worker. Disillusioned with the restrictions of the Thatcher era the Professor broke free to work in his own right, starting with his own company "Panic Puppets & Clowns". In the early 80 s he joined the fledgling "Zippo s Circus, Working with the Zippo's outfit enabled Panic to learn new skills and knowledge of travelling Circus. Panic eventually set out on his own to found the "Panic Family Circus " as a "Social Circus" dedicated to his lifetime commitment to child and person centred development and social justice. Panic brings to the circus his dedication to the "Play Ethic" and his belief in the power of games and play to teach and socialise. 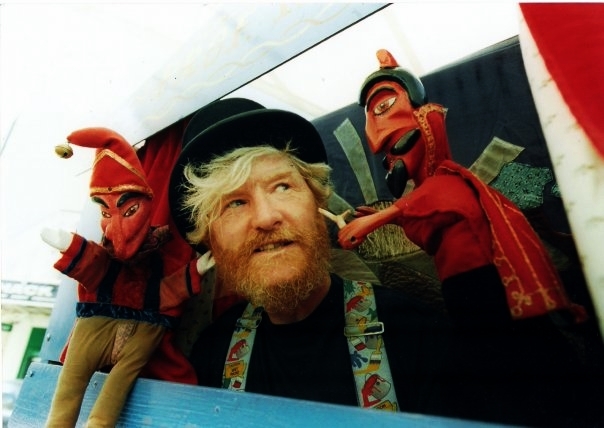 The Prof is a talented master Puppeteer with an inherited tradition of the family Punch and Judy Show,he is also an inventive and skilled storyteller with his amazing "Coat of 100 pockets"
Add to all this a skill as a master Puppet Maker and Sculptor. A bodger of all things needed . On top of all this he has a heart of gold and a great instinctive skill in the field of children and adults with special needs, making the environment of the Panic Circus a place where all are included and have their needs recognised and catered for.